Vital records research hours at the Huron County Clerk are fairly limited, allowing individuals to investigate genealogical records on Wednesdays only, from 10:00AM till 11:30AM, and again from 2:00PM till 4:00PM. Also, only one researcher and a friend are allowed at one time due to the small allotment of space. Marriage, divorce, birth, and death records are all available from 1867 to the present. It is advised to contact the Clerk's office prior to visiting to make reservations, just to ensure a seamless trip. 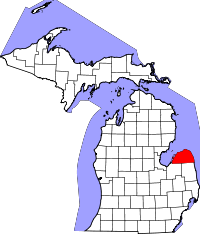 The genealogy research area is located in the County Clerk's office in the County Building of Bad Axe, MI., in Room 201. Huron County is a peninsula extending out into Lake Huron. It is not very far from the industrial centers of Flint and Detroit, and as such, is a popular vacation spot for Michigan residents. The area is primarily an agricultural center, producing large amounts of crops.